Had a great stay!..Staff is friendly and attentive. Great food and buffett. Where to find Grimsby hotels near an airport? Where can I find hotels in Grimsby that are near tourist attractions? Arranging some time in Hamilton and would like to stay in central Grimsby? Within easy driving distance of central Grimsby there are 4 lodging options you can choose from. If you are planning to book accommodation that is only a stroll from the center of Grimsby, Casablanca Winery Inn and Super 8 Grimsby Ontario would be perfect. 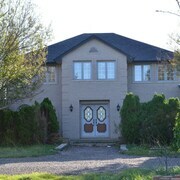 The Inn on the Twenty, an Ontario's Finest Inn is situated 18 kilometres (11 miles) away from the middle of Grimsby. Another accommodation option is the Homewood Suites by Hilton Burlington, which can be found 25 kilometres (16 miles) away. 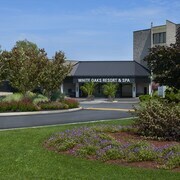 Other accommodation options include the Staybridge Suites Oakville and the Waterfront Hotel Downtown Burlington. If time permits, you could travel further in Southern Ontario. Southern Ontario is known for beaches, coastal plains and forests. Popular Southern Ontario tourist draws are traditional villages, churches and art museums. Common activities in this part of Canada include skiing. 25 kilometres (14 miles) to the northwest of Grimsby you'll find Burlington, where you can spend the day exploring Royal Botanical Gardens and Burlington Art Centre. 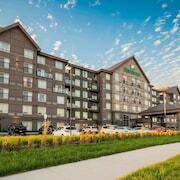 Burlington accommodation options are the Holiday Inn Burlington Hotel & Conference Centre and Quality Hotel. Alternatively, you could consider staying at Lincoln, 18 kilometres (11 miles) to the southeast of Grimsby, where you'll find the Jordan House and Coach House at Jordan Station. The Sawmill Golf Course and Twenty Valley Golf and Country Club are just some of the more popular places to check out while in Lincoln. Before you leave Hamilton, ensure you experience some local sport. Visit Air Canada Centre to the north of Grimsby. Sports fans wishing to find accommodation close to the stadium can make a choice from the The Ritz-Carlton, Toronto or the Four Seasons Hotel Toronto. Looking for the most convenient airport for your stay in Grimsby? John C. Munro Hamilton International Airport is 30 kilometres (18 miles) away. What are the most popular Grimsby hotels? Are there hotels in other cities near Grimsby? What other types of accommodations are available in Grimsby? Explore Grimsby with Expedia.ca’s Travel Guides to find the best flights, cars, holiday packages and more!